This article is about problems loading images (PNG, JPG, or GIF) or animations. It does not cover problems with video or plugins such as Flash. Those can be found in Video or audio does not play. Hold down the <Shift> key and click the Reload button to force a fresh reload of the page . 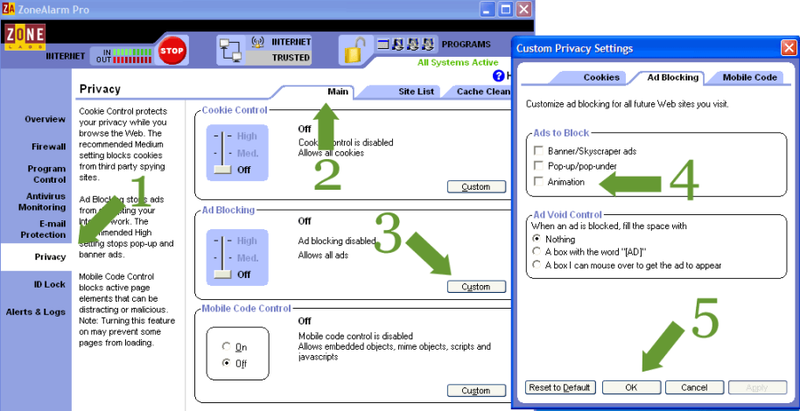 If you are using anything to block webpage content (e.g., Adblock or Adblock Plus, or a hosts file), disable it. If you use ZoneAlarm Pro or eTrust Firewall, see the Security software section below. If you have enabled network.http.pipelining (a "tweak" designed to improve page loading time), disable it in about:config by typing "pipelining" in the filter and right-clicking all entries and choosing Reset. (If you set this preference by editing the "user.js" file, remove this edit.) Some websites do not support pipelining, which may result in images not being sent. Clear the cache. In Firefox: "Tools -> Options -> "Advanced -> Network / Cache (or Offline Storage) -> Clear Now" (or use "Tools -> Clear Private Data", if "Cache" is selected in your Privacy / Private Data settings). In Mozilla Suite/SeaMonkey: "Edit -> Preferences -> Advanced -> Cache -> Clear Cache". Remove cookies. In Firefox: "Tools -> Options -> Privacy / Cookies -> Show Cookies" (or use "Tools -> Clear Private Data", if "Cookies" is selected in your Privacy / Private Data settings). In Mozilla Suite/SeaMonkey: "Tools -> Cookie Manager -> Manage Stored Cookies". If none of these suggestions help, try the rest of the solutions in this article. Make sure that "Load images automatically" is checked. Open [Exceptions] and remove any sites being blocked. Open [Manage Image Permissions] and remove any site listed with the status, "site cannot load images". If images are blocked on site, click on the location bar's favicon for "More Information" and check the Media tab there for "Block images from ...". (If it is check-marked, you probably did not open the Exceptions button above). Even if you can see the site and some images, third party images may still be blocked from other sites by Extensions such as "Adblock Plus" or with a hosts file. The site hosting the images may be down or experiencing difficulties, try loading the site from another computer or browser to see if this is the case. A router or security software is blocking what appears to be an excessively large number of connections (interpreting it as a "SYN flood"). This can be caused by changing network settings in Firefox, or by inappropriate settings in the router or security software. Images from a site can be blocked from a context menu (right-clicking, in Windows). A site could be blocked accidentally by right-clicking on an image. Some image references contain backslashes (e.g. something.com\blah.jpg), which cause the images to be loaded in Internet Explorer but not other browsers. If you see the image's URL contains a backslash, contact the webmaster about the issue. The Slashy extension will let you work around this problem. Some sites will block the request if no referring URL is sent. Use about:config to make sure that the preference network.http.sendRefererHeader is set to "2" (default) and reset, if necessary. Also make sure that all proxies, firewalls, and other security software allow the referrer to be sent. As a security precaution, references to images on your local computer from a remote web site are disabled. If you encounter this restriction and you understand the security implications, you can disable this security measure. Many of the solutions under Error loading some websites and Websites randomly don't load will also fix image loading problems. If the colors appear wrong, try the solutions in Website colors are wrong. If you are using any sort of web accelerator software, disable it and see if images load properly. See Page displays as gibberish. none: animated images will never play. once: animated images will play once. normal (default): animated images will play as normal. Open the Firewall Control Center. Select "Privacy" on the left tabs. Select "Custom" in the Cookie Control section. Uncheck the box for "Disable web bugs" in the "3rd Party Cookies" section. Select "Custom" in the Ad Blocking section. Uncheck the box for "Animation", as shown here. If CA Personal Firewall 2007 is installed and images on certain websites aren't loading, see the support document, Pictures do not load on websites since installing CA Personal Firewall 2007. Try the rest of the solutions in Websites look wrong. In some cases, a corrupt profile can cause images not to load. To see if this is the case, close your browser (if open) using "File -> Exit" and make sure it is not running in the background. backup your profile, then create a new profile. If it works, you can selectively copy back your important profile data to the new profile. If it still does not work, you should perform the rest of the standard diagnostic.